Who can forget as a child plucking a plastic duck from the water and eagerly checking the number on the bottom to see what you've won? This classic game into the new century, with it's sturdy, light-weight, completely portable Duck Pond (sometimes called pluck-a-duck). 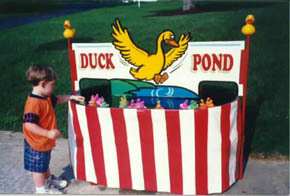 The Dunk Pond uses plastic or rubber ducks floating in the water. The child picks a duck and turns it over to reveal the winning number on its bottom. It's submersible electric water pump keeps those ducks moving and the fun flowing. Size: Height: 2ft. Width: 5ft. Depth: 5ft.